I thought that we may try something a little different here, how about an enamel & membership badge manufacturers database? 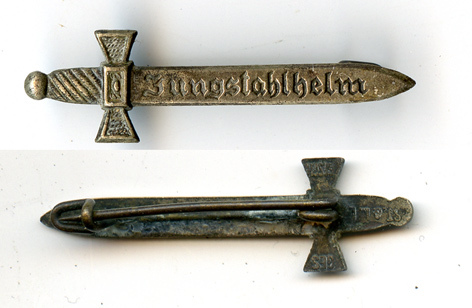 Many membership badges such as the NSAD & Deutschen Christen only ever had one maker. However, many of the more common badges were contracted to several manufacturers. Lets see if we can start a database of the various makers & marks from the more common badges. I do not intend to feature the Party badge as that has been done with great success on WAF, but the H.J. diamond I'm sure could be equally as interesting, along with many of the more common badges. Start a thread as normal, adding/posting any known maker variants as we find them. I will post the link for it here, so that it can be reached quickly for future reference. Thanks Robert, I hope that it will be a success, as you can see I've added a couple of more. I'm holding off on the Frauenschaft at the moment as I'm not sure how to tackle them, there are so many variations as well as makers. However once I've thought it through we'll do them as well. Don, a note worthy idea! Wish I could be of more assistance. Any items I have that you wish to see posted, you have but to ask! Just started my collection a little while ago. This info. will seriously help. Thanks. With all the links you added on this post, it makes it easier to find all the information and great photos you posted on the WWII German badges and pins. Looks good Don, Thank you for all the work that went into this superb database. Thank you Gentlemen, I've also added the SA Reserve II. If you have any with a different maker please add them. This remains my favorite database. Wonderful, excellent, thank you very much. Hi Don, Maybe you can put these two in their respective sections. I'm not sure whether we have a Stahlhelm thread, I'll have a look, it maybe in the Imperial section.